In a small bowl whisk together the olive oil, vinegar, and all of the seasonings. In a food processor pulse the carrots, onions and garlic until diced. Could also dice by hand, I just like easy! 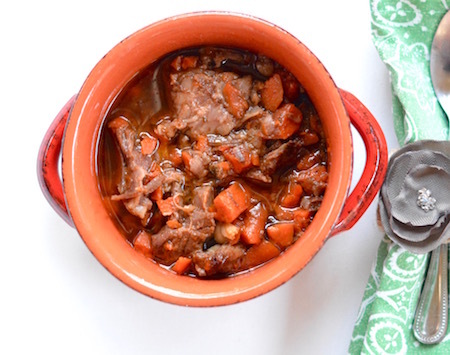 Place the carrot mixture in the bottom of the slow cooker, add the roast to the slow cooker. Drizzle the oil mixture over top. Cook on the lowest heat setting for 8-10 hours. Shred the meat with a fork when you are ready to serve! I thought one ingredient had been left out of the recipe so I added unsalted beef broth to mine. It cooked all day and when it was time for dinner we had an amazing meal. I would serve this to anyone. I love easy but delicious and flavorful dishes. This is IT! This was super flavorful and tasty; however, not nearly enough liquid to adequately cook this roast. I followed the recipe exactly as it is written and started cooking it in the morning around 9 am and left for work. Luckily my husband came home around 3 pm and checked the roast and the crockpot was virtually dry. He added water and salvaged the meal. Be aware and add water especially if you’re leaving your house all day; otherwise, you’ll need a Plan B for dinner. I like how this recipe tells you the protein and veg count and gives more details on the servings. Makes it easier to count calories. wish someone could update the fajita soup recipe too.